A new concept comes to Flitwick – ChangeMe! 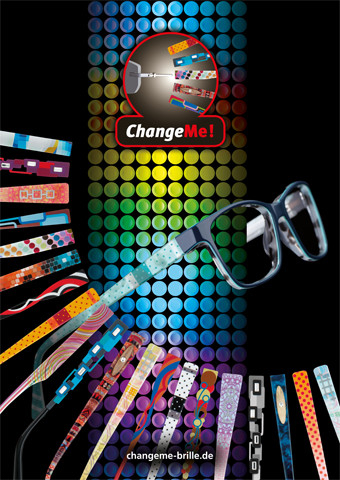 With ChangeMe’s unique system you can transform your glasses for every occasion. Thanks to their exchangeable temples, you can modify your glasses without tools in seconds. The Change Me frames come in 30 different models plus all are available in various colour combinations, there are also over 140 different side designs now available. No tiny screws or mechanical fiddling are involved here, you simply push a specially designed catch and you can completely change the look of your specs to suit your fashion colours, moods or activities in seconds. We will adjust each frame side you purchase so they will always fit snugly around you ears. Why buy multiple frames with expensive lenses when you can have a different choice each day of the week? Finally, eyewear that will truly reflect your style. You can even customize your temples with an original photo.